We should have seen it coming, when the season began with Dante in paradise, but the last two episodes of the series have definitely taken a dystopian turn for the worst. 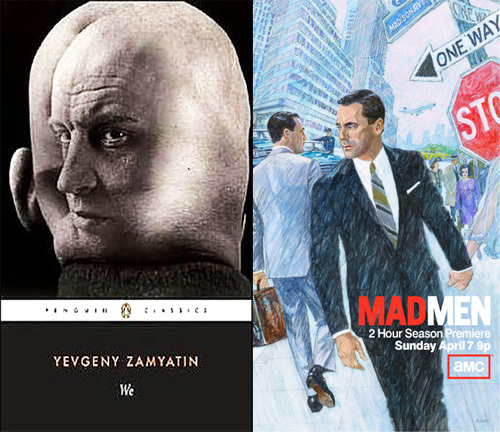 Matthew Weiner’s use of biblical, formulaic and futuristic allusion throughout the season in several ways mirrors motifs introduced through dystopian literature, specifically in the early Russian science fiction novel “We” by Yevgeny Zamyatin. The narrator of “We” is a young man who lives in the futuristic One State, a world overseen by the great Benefactor. Individuals do not exist in One State, only We exists and the narrator’s identity has been reduced to a letter and number D-503, which also signifies his apartment of residence. One State is founded on the principal that pure happiness can only be achieved in a world measured by formulaic reason. The narrator works as an engineer, building the spaceship Integral, which will be launched to imprint One State’s method of oppressive societal purification on the less-advanced societies that live beyond the Green Wall. The narrator begins to question his existence when he falls in love with I-330, a young woman who challenges the authority of The Benefactor and is planning a revolution against One State. After meeting I-330, the narrator senses that he is not one, but two of himself. His former self is a being governed by the rules of reason, whereas his new self is controlled by instinctual impulse and plagued with a primal sickness marked by dreams and known in One State as Incurable Soul. This may all sound light years away from 1968 Madison Avenue, but this week’s episode, “Man With a Plan,” inspired the comparison. When Don meets Sylvia in hotel room 503, it alludes to the identity of the narrator in “We,” whose his apartment number in OneState is D-503. Sterling Cooper Draper Pryce & One State: Don and Ted’s compliance with Chevy’s formula for the perfect agency was appropriate considering that they would be working together to sell Chevy’s new “perfect car.” Unlike Jaguar, a brand reliant upon its frivolity and luxury, Chevy’s new model would capitalize on the ultramodern use of computer technology. The implication of the merger, along with the flavor of the new campaign, closely echoes the principles governing One State: perfection is achievable through technological advancement, formulaic reasoning and the sacrifice of individualistic freedom. For the first time, Don will be expected to partially surrender creative control to his professional equal, Ted Chaugh, for the betterment of the company. If Weiner was at all deliberate in associating Don with D-503 and is in fact thematically channeling Yevgeny Zamyatin, it will be interesting to see how he incorporates “We” into the second half of this season. Several characters in the novel evoke an emblematic resemblance to this season’s auxiliary cast. Unfortunately, Zamyatin provides no hypothesis for the fate of Bob Benson. So far, ominous murmurings of civil rights and Vietnam have peppered the episodes, in cocktail conversation and background radio, but 1968 really soaked in on Sunday, when Matthew Weiner decided to dress Don up in a tuxedo on the night that Martin Luther King Jr. was assassinated. Weiner was bold in choosing to focus on MLK’s assassination, considering the criticism the series has received for failing to infuse its African American characters with the authentic dimensionality that has defined the core cast. But since “Mad Men” is simplistically a show about a Madison Avenue advertising agency in the 1960’s (and not about the 1960’s itself), it seemed appropriate that Weiner didn’t attempt to use the event as an opportunity to cheaply memorialize the civil rights movement. Instead, the plot developed around the central characters’ (primarily upper-middle-class-white ones) respective reactions to the tragedy and the turmoil that followed. The hour begins with Don and Megan, along with the rest of the SCDP crew (plus Peggy), at The Ad Club of New York’s Awards Dinner. A tiny Paul Newman is just wrapping up his speech when an anonymous crowd member shouts that Martin Luther King had been shot. Everyone moves to the lobby, stunned by the news. Abe heads up to Harlem in a tux, Megan dries her tears on Don’s shoulder, Peggy pops a breath mint and Pete gets aggravated with everyone ahead of him in line at the phone banks. 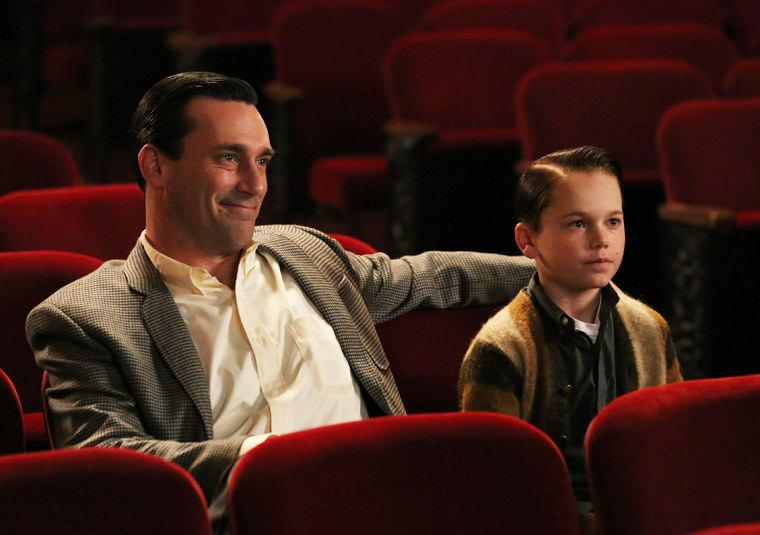 Thematically, the episode was very similar to a combination of Season 2’s “Meditations in An Emergency” (which pivoted around the Cuban Missile Crisis) and Season 3’s “The Grown Ups” (which followed the week of John F. Kennedy’s assassination). All three episodes are hinged on the notion that in times of fear and sadness, people seek love and security. But I thought “The Flood” was most effective at communicating catastrophe’s ability to temper existential indulgence, to push people to glean a version of clarity through the promise of purpose that comes only through family. After news of the assassination, Pete displays some uncharacteristic decency when he calls his wife Trudy, asking to come home and be with her and his daughter Tammy. This is a stark contrast from Pete’s behavior in “Meditations” when Trudy asks Pete to come with her to Rehoboth Beach out of apocalyptic precaution. Pete responds, “If I’m going to die, I want to die in Manhattan.” After Trudy’s response to him this week, I wouldn’t be surprised if he does. At the office the next day, Pete instigates an argument with Harry when he expresses frustration that business will suffer in wake of the tragedy. “It’s a shameful, shameful day,” Pete says, reprimanding Harry for his insensitivity and reminding him that MLK “was a man with a wife and four children.” The scene suggests that Pete, despite his terribleness, may have a soul. I’m not sure there’s hope for Harry. Don, whose initial reaction to the tragedy closely resembles his response to JFK’s assassination, appears genuinely moved after a trip to the movie theater with little Bobby to see “Planet of the Apes” (twice). Don is touched by Bobby’s reaction to the to the film’s bleak conclusion, coupled with his unassuming exchange with an African American usher at the theater (“Everybody likes to go to the movies when they’re sad,”). Later that evening, hunched in his bedroom, Don tells Megan that he’d only ever felt a kind of guilt-induced love for his children, but “[t]hen one day they get older, and you see them do something and you feel that feeling that you were pretending to have. And it feels like your heart is going to explode.” Don’s paternal epiphany is tainted when Bobby later tells Don that’s he’s only scared his stepfather Henry Francis (aka Don’s replacement) will be killed just as MLK had been murdered. “Henry’s not that important,” Don responds. The final scene of the episode is Don standing on his balcony, overlooking a city drenched in mourning. It suggests that Don is beginning to realize he, too, may not be all that important. Perhaps it takes a tragedy of this proportion to make a Don Draper realize that the “catastrophe of [his] personality” that he’s been quietly nurturing since Season 2 may in fact never “seem beautiful, or interesting, or modern” again. In “Meditations in An Emergency” Don is living in The Roosevelt Hotel, “staring at the back of Sally and Bobby’s heads,” when he decides to write Betty a note telling her how much he loves her and at the end of the episode Don moves back home and Betty tells him she’s pregnant. In “The Grown Ups” the tragedy of the day was counter-balanced by the celebration or Roger’s daughter’s wedding. “I can’t sit here and watch the T.V. all day,” Don says to Betty. “Bars are closed,” Don says in response to Peggy asking why he’d come in to the office. Meditations in An Emergency by Frank O’Hara, as quoted by Don. Yi! News Blog at WordPress.com.